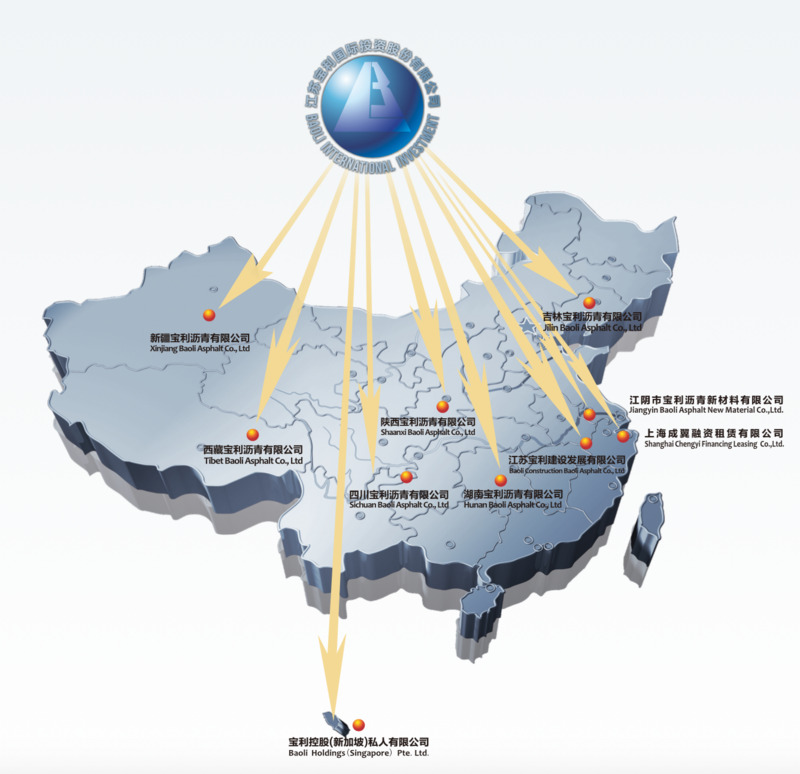 Structure / BAOLIRUS International Investment Co., Ltd.
At present, the company has formed the national Chinese regional layout with Jiangsu Baoli as the main body, and 9 companies: Shanxi Baoli Asphalt Co., Ltd., Hunan Baoli Asphalt Co., Ltd., Jilin Baoli Asphalt Co., Ltd., Xinjiang Baoli Asphalt Co., Ltd., Tibet Baoli Asphalt Co., Ltd., Jiangsu Construction Baoli Asphalt Co., Ltd., Jiangyin Baoli Asphalt New Material Co., Ltd., Shanghai Chengyi Financial Leasing Co., Ltd..
Baoli Holdings (Singapore) Pte Ltd. is a first international subsidiary of Jiangsu Baoli registered in July 2013. The Company is mainly engaged in the sale of asphalt and high strength framework asphalt and the investment in foreign countries. In 2015 the Board of Directors of Jiangsu Baoli International Investment Co., Ltd. decided to enter foreign markets of Russia and CIS. That was a reason why Russian and Belorussian subsidiaries were registered. The Russian subsidiary called BAOLIRUS International Investments Ltd. was founded in July 2015. Shanxi Baoli Asphalt Co., Ltd.
Hunan Baoli Asphalt Co., Ltd.
Jilin Baoli Asphalt Co., Ltd.
Xinjiang Baoli Asphalt Co., Ltd.
Tibet Baoli Asphalt Co., Ltd.
Jiangsu Construction Baoli Asphalt Co., Ltd.
Jiangyin Baoli Asphalt New Material Co., Ltd.
Shanghai Chengyi Financial Leasing Co. Ltd.
Baoli Holdings (Singapore) Pte. Ltd.